Mt Fuji Challenge – Success!!! After a long and gruelling two days in the mountains, Alex Paul, Taro Ishikawa and Jonathan Lutwyche have now arrived back in Tokyo victorious, though with very, very sore legs! Breakfast at 12 midnight at the mountain hut. Jonathan tucking in to a dried fish sausage! Having taken 3 trains (including the famous Bullet train) from Kyoto, we took a bus up to the start of the route. The team then set off up the slopes of Mt Fuji and reached the mountain hut early evening. Veg curry, green tea and a beer to keep the spirits high (and the cold out! ), we settled down for a short night’s sleep. We woke at midnight and enjoyed a typical Japanese breakfast before heading for the summit. 4 hours later, having climbed many thousands of steps and seen an equal number of Japanese walkers, we were approaching the summit. 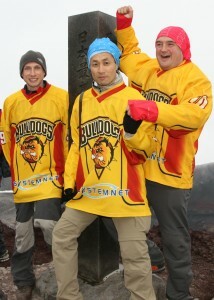 At around 5am, Alex, Taro and Jonathan donned the famous Bulldogs shirts, victory was ours! We had one serious moment when Alex was overcome by a suffocating miasma of stale sweat arising from the senior bulldogs kit! That aside, we were all safely at the top. The long walk down was crippling for some of the older and rather more rotund members of the team… A couple of beers and a Chinese dumpling back at the bus station and things were back to normal! Alex and I would like to take the opportunity to thank a very special man, Taro Ishikawa. Without his extraordinary efforts and logistical talents the challenge would certainly not have taken place! 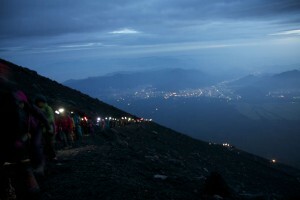 We should also like that thank all those many people who have supported the Mt Fuji fundraising effort to date. I’ll keep the page open for a few days for anyone still wishing to contribute; link to ‘Players International Development Fund’.